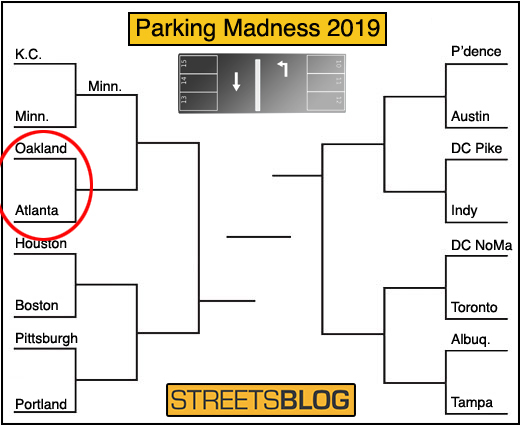 We’re on to our second round one match in this year’s Parking Madness competition — comparing different cities that have repaired their parking craters with useful infill development: more city! This competition highlights a really hopeful trend underway in cities; Parking craters all over the country are disappearing. In our first matchup, Minneapolis knocked off a formidable contender in Kansas City by a decisive 64 percent to 36 percent final score. 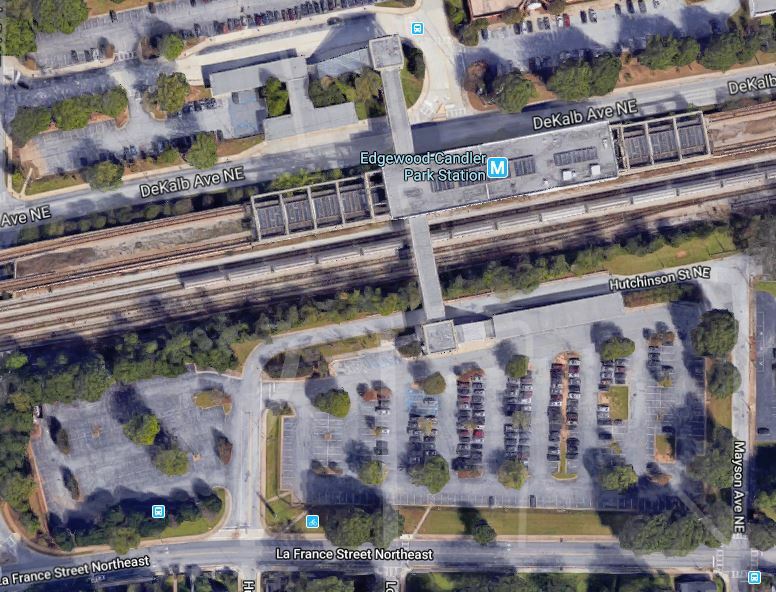 Today’s matchup features two former parking craters next to transit stations in Atlanta and Oakland. The photos below show the Candler Park MARTA Station on the east side of Atlanta. Atlanta’s transit system built a lot of Park and Ride stations in its historic, streetcar suburbs. Edgewood/Candler Park was part of the first stations to open in 1979, it is located three miles outside of Downtown Atlanta. 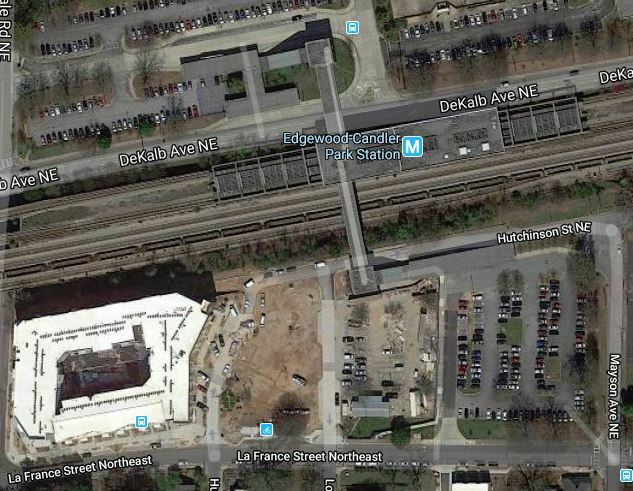 MARTA’s Edgewood/Candler Park was the first transit-oriented development built on existing surface park-and-ride lot. It meets MARTA’s goal of affordable units, has a small buried parking garage. 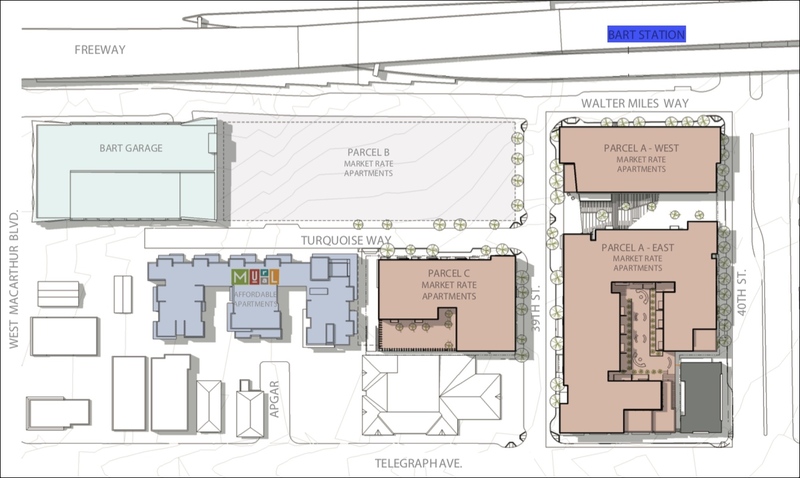 Phase II includes a public greenspace and commercial space. Atlanta’s transit agency, MARTA, deserves credit for taking the lead in redeveloping parking lots by its rail stations, and trying to include affordability. These developments produce more housing options for Atlantans in walkable areas and help boost ridership by expanding the population living near transit. Here’s a great roundup from Curbed of all the projects MARTA has helped developed. Next up, we’re looking at the MacArthur BART Station in Oakland California. This submission comes from reader Adriana Valencia, who notes, as you’ll see, that it’s still under construction. Still in-progress. But impressive transformation nevertheless! The BRIDGE housing component is already done, a parking structure is done (it’s what they did first.) Parcels C and D are either open or about to (maccommons.com) and the Parcel B tower is on its fifth or sixth story of a 20+-story tower. One really nice feature of both of these projects is that they include some affordable housing. Transit-oriented development that includes affordable housing is really important if transit agencies are trying to boost ridership, because lower-income people rely on transit much more than higher-income. That MacArthurt BART “before” photo is good and old. It’s missing some buildings erected in 2008. 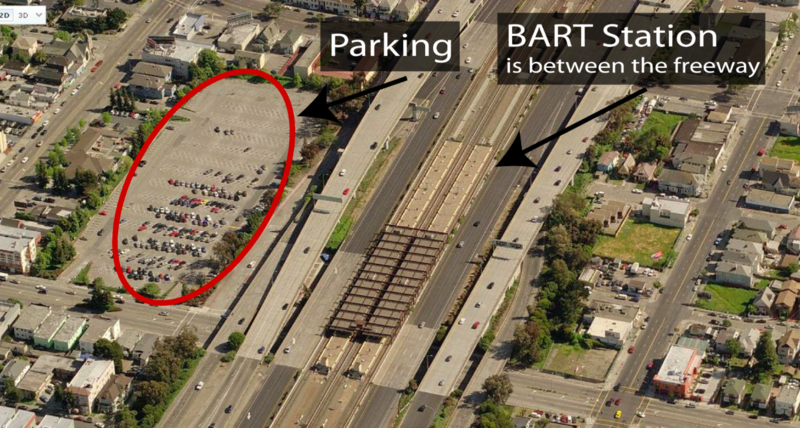 It’s worth noting explicitly, BART has a policy of replacing any “lost” parking. It’s why they built a multistory parking structure before building housing. Because the Bay Area is well known to have a “Parking Crisis” and “Housing Craters”. It is good to see that Oakland is breaking up that giant block, too. But yes, they need to charge more for parking; $3 in the middle of a city (next to a rail line) in crazy-low. MARTA in Atlanta is doing the “replacement of lost spaces” thing too with it’s transit oriented developments (which, to my eyes, are more like transit-proximate developments, since in design they don’t seem any less oriented to cars than your average Texas Doughnut located anywhere). Is this a federal requirement for stations that received FTA assistance? Someone told me it was but I don’t know. BART doesn’t charge more than $3 at all their stations except Oakland West. If they increase their parking fee structure they would potentially lose customers to buses and promote more solo occupant vehicles to drive to work. Caltrain charges more than twice that for parking and people still park; however, those with 2+ zone passes (Caltrain) can ride Samtrans/VTA buses free. Maybe BART can work out a similar deal for East Bay buses, or people can car-pools to the station, ride bikes, etc. I wouldn’t say CalTrain’s $5.50 parking is more than 2x BART $3 parking but good try. CalTrain is the main public transit for peninsula without a freeway HOV lane to SF whereas the East Bay Freeway 80 has an HOV lane which makes casual carpooling at $1 a popular option. Raising BART parking to $5.50 will likely incentivize more commuters to drive solo and/or casual carpool. I’ve taken BART and don’t feel safe or comfortable with rude or loud riders with packed trains and would not ride it on a regular basis. If you think East Bay commuters will continue taking BART after raising parking fees you have too high an opinion of BART as a transit mode and naive to think East Bay commuters will find other modes of transit to commute to the BART station. Taking an AC Transit bus to the BART station gives them a 25 cent discount = $2.10 local bus fare to BART. If they’re going to pay $2.10 to take a local bus to BART and pay a separate BART fare the commuter may as well apply that $2.10 local fare as a free transfer to the transbay bus. Sorry, I was thinking that they had bumped it too $6 (I walk past the Redwood City Caltrain parking lot almost every day and it is filled… they could easily raise the rate there. Same thing for most Caltrain stations, where most people walk or ride transit to get there (at least in SF and San Mateo County, less so in Santa Clara County…). In general, it is not wise to have parking cheaper than a bus fare/pass. But if BART passengers to switch to buses, that is not a bad thing as BART has been packed in the last few years. Since CalTrain doesn’t have any competition other than SamTrans with neighborhoods commuters feel they need to avoid I could see a parking fee increase would have a negligible effect on ridership. Except for West Oakland in recent years BART determined parking fees based on station demand. Stations such as Richmond and Coliseum (both in bad neighborhoods) formerly had free parking but uniformly made parking fees all the same at $3. I don’t have any data whether Richmond or Coliseum ridership declined after the increases but would guess ridership at Richmond remains low since it’s located in the bad part of Richmond away from the freeway, and the more popular option is to bypass Richmond in favor of El Cerrito Del Norte which is closer to the freeway. Reminder: casual carpooling is a popular option in the East Bay so raising parking fees would incentivize more carpooling and less commuters taking BART. I don’t know. Don’t most of the BART park-and-rides fill up, and fill up early? That was my understanding. Increasing parking charges at transit stations would increase ridership. Moving to hourly charging and increasing the rate would encourage short stay car parking, potentially enabling 2-3 passengers to park instead of 1. A suburban light rail station surrounded by highways and shopping mall parking lots takes on three light rail stations engulfed by sports stadium parking. 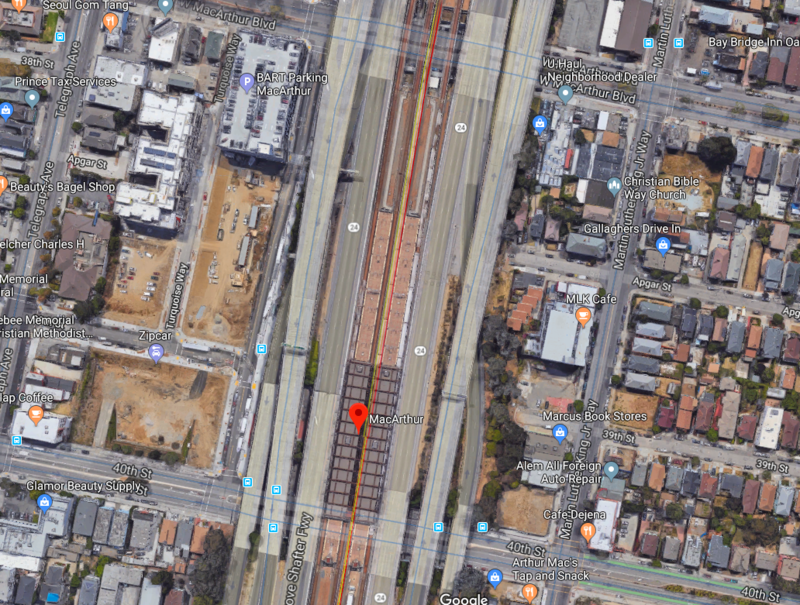 The second round action continues in Parking Madness as we hunt for the most appalling parking craters next to transit stations.